As a traveller, imagine asking for a 'cerveza' without hand signals, saying 'hola' to the locals and easily finding where the toilets are? If you wish to learn a few phrases before you go or are on the road right now, the WorldNomads Spanish Language Guide will get you rolling your rrrr's in a jiffy. 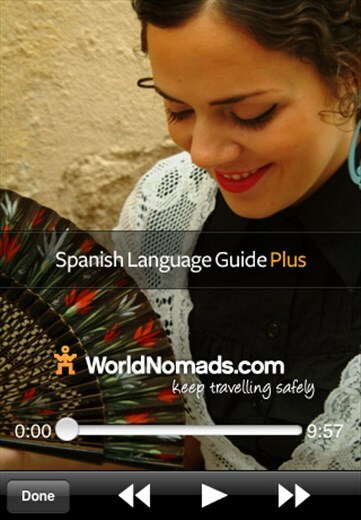 The WorldNomads Spanish Language Guide Apps are perfect for travellers wanting essential phrases, not an advanced course. * Additional phrases on work and holiday. Who knows, your trip could turn permanent! Make your next trip a breeze with a WorldNomads.com Language Guide. The locals will love you for it. World Nomads Language Guide Podcasts are free to download and may be used as free content on other websites so long as no part of the podcast is changed, altered or added to in any way. World Nomads Language Guide Podcasts may not be sold by any website or individual. © WorldNomads.com Pty Ltd, 2006-2012.